Hope's Cafe: SFF #12-Plow and Hearth Review and Giveaway!! If you've been reading my blog for any period of time, then you know that Plow and Hearth is one of my favorite companies to feature. The ultimate in online shopping for products for your home. However, you may not be aware that Plow and Hearth also has a nice selection of clothing! 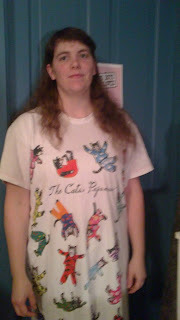 I received the Cat's Pajamas Nightshirt for my review. This is a really cute nightshirt, with cats in various pajamas and poses, all over the front of the shirt. It is made of 100% cotton, and is super soft and comfortable! Available in a one-size-fits-most, the shirt is roomy and hits a little below knee length on me. I love wearing this to bed, and it has become my favorite sleepshirt! Even after quite a few washes it has kept it's shape and comfort, and the screen printing hasn't faded at all. I like the fact that this nightshirt has a regular crew-neck. I don't wear pajamas with v-necks, and it seems like it's getting harder and harder to find anything but v-neck! The shirt is also short sleeved, so it's perfect for the gradually warming weather. As we have grown during the past quarter-century, we have remained dedicated to the same principles that have guided us from the beginning and to which we attribute our enduring success: honesty, integrity and most importantly, our commitment to customer service. We treat our customers like neighbors and friends. We offer only products we would use ourselves, at fair prices, and we guarantee them without condition." One of my readers will receive the Cotton Sleepshirt of their choice form Plow and Hearth! I would choose the Dogs...Ruff Night. These sleepshirts are so cute! I would select the dog sleepshirt. I entered your Striped Shirt for Mommy and Me, MyHeadCoverings $20.00 GC and Vedette Shapewear giveaways. I like the Ruff Night one. I would choose the Social Butterfly Sleepshirt. I might choose the Falling to Sleep sleep shirt. I entered My Head Coverings. I entered Monogrammed Gift of Choice. I would definitely get the Cat sleepshirt, but also like the flower bed. I like the Flower Beds one. I like the social butterfly one! I would get Ruff Night. Cute! !